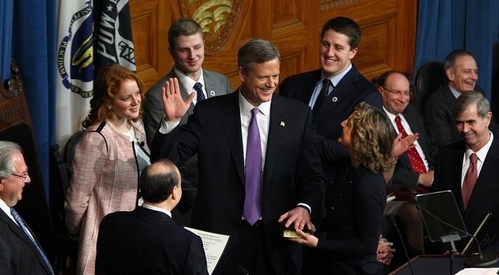 With his left hand on a family Bible held by his wife, Lauren, Charlie Baker is sworn in as the 72nd governor of the Commonwealth of Massachusetts. TALK ABOUT an inspiring inaugural address! "Last fall," the new Republican governor declared, "the people of Massachusetts voted to disenthrall themselves from the failed dogmas of big government." Alas, those weren't the words of Charlie Baker upon taking the oath of office Thursday. They were those of former Governor William Weld on the day he was sworn in 24 years ago. Weld is often described as Baker's political mentor, but there weren't many Weldian sparks in the new governor's prosaic speech. Another Republican who came to the Corner Office after years of Democratic rule, Weld promised revolutionary change. He aimed at nothing less than "reinventing the way state government functions." He was willing "to offend some and anger others" in shrinking the state's budget, and intended to raze "bureaucracies 50 years out of date, sluggish and centralized, in which hierarchies rule and orders are issued from the top." There was no hint of such fervor from Baker. Sure, he reminded his listeners of the "dozens of lapses in performance" under Deval Patrick's administration, and emphasized the big hole in the budget he is inheriting from his predecessor. But anyone waiting for a rousing call to arms waited in vain. Where Weld envisioned dramatic transformation, Baker dreams of a tune-up. His model, he suggested, was the late Tom Menino, with his focus on the gritty mechanics and details of public policy. For Baker, as for every governor, deeds will matter much more than words. Weld's performance never lived up to the glittering hopes raised by his inaugural address; perhaps Baker's record will far outshine his own low-key opening remarks. The commonwealth's new chief executive may never be a great speaker. If he proves to be a great governor, that will be inspiration enough. Who'll be looking down on Baker?